BelarusDigest > All > The Ukrainian Flag Banned in Belarus? On 21 November the Minsk Arena hosted the famous Ukrainian rock band Okean Elzy, who are known for their support of Euromaidan and its pro-European orientation. The musicians did not raise any political issues during the gig according to agreement with the administration, but their concert became politicised nonetheless. The next day videos appeared online in which policemen refused to allow people sporting the colours of the Ukrainian flag into the concert and even went so far as to pull a flag out of a fan’s hands inside the venue. Belarus has so far only placed a ban on the Belarusian national white-red-white flag which is considered by the authorities to be an anti-government and anti-Lukashenka symbol that is unauthorised at public gatherings. With the start of Euromaidan and the Ukraine Crisis the symbols of these conflicting sides have also become a target of political persecution. The Russian government banned Okean Elzy from holding concerts back in the spring while the Euromaidan revolution was unfolding in Ukraine. St Petersburg city government representative Vladimir Milonov accused them of radicalism and holding anti-Russian views and went on to urge the Minister of Culture to restrict their activity in Russia. Shortly afterwards several entertainment agencies informed the band that they were not going to be able to have any concerts in Russia. However, in Belarus Okean Elzy does not face any restrictions so far. On 21 November they played a gig at the largest concert hall in Minsk — the Minsk-Arena, which holds a total of 15,000 people. The band was truly triumphant in their return to Belarus with a hall full of fans – a rare situation for Belarus. This itself did not come as much of a surprise as the previous Okean Elzy concert in Minsk, back in December 2013, had a similar turnout. Deputy Director of the Minsk-Arena Mikalaj Serhiejenka commented after the concert that the administration had discussed the set list with the band in advance and asked them not to sing certain songs that might be viewed as having political undertones. “We do not want to escalate the atmosphere during the concert as it can lead to some kind of abnormal action”, he said. In compliance with this agreement, Okean Elzy did not raise any political issues during the concert. The next day, however, a video appeared on the Internet in which plain-clothed policemen, who were searching audience members, refused a group of girls enter the concert with a Ukrainian flag. They forced visitors to leave all symbols containing yellow-blue Ukrainian colours in a cloakroom outside the hall. The girls demanded to see some kind of documentation that forbade Ukrainians symbols being displayed at concerts, but instead they received only a vague response that “this is not a political event”. After some resistance and the police's own persistent demands, they gave in after being threatened with arrest. Another video from the concert showed a policeman pulling a Ukrainian flag out of a fan’s hands after failing to persuade her to give it up voluntarily. In an interview with TUT.by after the concert, Volha Kavaĺkova and Maryna Chomič, the girls from the same video, said that “the police did not even let people in with small Ukrainian flag ribbons on their bags. They even insisted that we remove a ribbon from my friend’s hair”. The Minsk-Arena web site only says that visitors cannot display symbols of fascist or racist content at concerts. The concert organisers acknowledged that the decision to ban Ukrainian flag came from the Minsk police. Regarding the inquiries made by TUT.by journalists, the Press Secretary of the Minsk Internal Affairs Department explained that flags and other things might disturb other visitors, and their use was restricted strictly in the name of security. @BelarusMFA Калегі, гэта нармальна? – https://t.co/xtXxqIHseu Няўжо ўкраінскі сцяг забаронены ў Беларусі? On 24 November the Belarusian MFA replied to the tweet “According to the Ministry of Interior, when the house is full, the same thing would be seen with the Belarusian flag because it should not disturb the spectators. 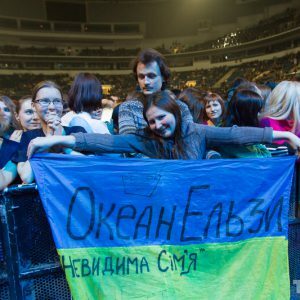 Our people love Okean Elzy!” The Ukrainian reply was “Thanks for the reply, but I cannot imagine [a scenario where] the police handled the Belarusian flag with equal disrespect and brutality”. On 25 November the Belarusian Ambassador to Ukraine was summoned to the Ukrainian MFA. The Ukrainians asked him to explain the incident with the flag and he replied that concert regulations do not allow for it to be displayed. However, he failed to explain why the police handled the flags with disrespect. In Belarus, the white-red-white flag that was abolished by the Lukashenka-initiated referendum in 1995 remains one of the most contentious of outlawed symbols in the country. The flag can only be used as a BNF political party symbol at officially sanctioned meetings and pickets. Otherwise its appearance in public is regarded as a kind of anti-government protest and is a regular target for the police. Merely displaying it in a public place is qualified as an "unauthorised action" that can lead to fines being levied or even a few days in jail. Even hanging the flag out of the window of your own apartment is illegal. The most famous case of a demonstration held under the white-red-white banner occurred in 2010 in Viciebsk when the activist Siarhei Kavalienka placed a flag on the top of the city's downtown Christmas tree. Thus far this has also been the only strictly flag-related criminal case, though Kavalienka was accused of disturbing public order. Despite the authorities’ claims that during a concert flags cannot be displayed on security reasons, the official Belarusian flag can regularly be seen at concerts. In fact, before the Euromaidan revolution, the Ukrainian flag also was not considered a “political symbol”. Afterwards, however, it has become highly politicised and a source of potential problems with the police. It now appears that besides the white-red-white flag, symbols employed during the Ukraine crisis have also received official censure. The flags of the Donetsk and Luhansk Peoples Republics have yet to show up at large public events, but during Victory Day this past May, Belarus banned the use of St. Georges ribbons – a World War II symbol that has also become a symbol of the pro-Russian separatists in Eastern Ukraine. Another remarkable case of pro-Russian symbol restriction occurred back in November 2012, when the Mahilioŭ local authorities forbade the organisers of “Slavic March” to use a black-yellow-white flag – the traditional symbols of Russian monarchists and nationalists. In effect, this means that the authorities are restricting not only the symbols of the democratic opposition but every other dubious political symbol that they cross. Belarus continues to maintain its balancing act between Russia and the West on the Ukraine issue, all while trying to be a reconciling partner for the conflict. Clearly, non-alignment will remain an important element of Belarus's foreign policy, including the symbolic dimension that this entails. The Belarusian police, as usual, will continue to try to serve Lukashenka to the best of their ability, even if that means ensuring that the smallest disagreeable symbol does not rear its head in public. On 9 November 2014 in Pastavy – a city in the Vitebsk Region of Belarus – members of the Holy Rus' Movement distributed flyers with a call for the unification of the 'Russian World'. Many similar events and military camps now taking place for Belarusian youth near Minsk and Vitebsk and exhibit a rather disturbing trend. At camps organised by organisations such as Kazachi Spas or The Orthodox Brotherhood, soldiers and veterans instruct Belarusian youth and teenagers about the tactics employed by sabotage groups and how to handle weapons and survive. The Ukrainian 2014 revolution and subsequent events clearly triggered pro-Russian centres and groups to activate themselves. Kazachi Spas and The Orthodox Brotherhood promote themselves in Belarusian media as anti-globalisation, traditional and orthodox communities. They also pay a great deal of attention to religious and pro-Russian ideological aspects. In order to be able to work effectively, these radical organisations need support from the authorities in Belarus. Opened in June 2014 the Centre of Russian Culture and Science in Brest became the first official regional pro-Russian headquarter in Belarus founded by Rossotrudnichestvo. According to the founders of the centre, institutions like theirs launched their projects around the world as a result of a personal order from none other than Vladimir Putin himself. Trying to maintain Russia's influence in the CIS, Putin increased the budget of Rossotrudnichestvo nearly four times in 2014 – up to $300m. Rossotrudnichestvo is a federal agency in charge of maintaining Russia's influence abroad. Besides its new headquarters, Rossotrudnichestvo finances Rus Molodaya – an ultra-right movement with branch offices in Belarus. Closely linked to the ultra-nationalist paramilitary group Russian National Unity, Rus Molodaya also aims to establish a “New Russian World”. Other Russian NGOs have become more visible too. Members of the Russian Public Movement for the Spiritual Development of the People for the State and Spiritual Revival of Holy Rus' (Holy Rus') also became active in Belarus in 2014. Registered in Russia, this NGO has basically transformed into a cult of pro-Russian ideology. It works on spiritual development and unity of citizens of all nationalities living in Russia and has several offices in Belarus. The more recent activity of Holy Rus' in Belarus includes several other gatherings including, for example, in Maladzyechna near Minsk or a November 2014 meeting in Vitebsk. According to the Holy Rus’s web site they are also distributing leaflets at holidays in several locales like Homel, Vitebsk and Postavy. According to these leaflets, Belarus and Ukraine should become part of an indivisible Holy Rus' and unite with Russia in the future. Some other radical organisations have sprung up in 2014 as well, including the Military-Patriotic Orthodox Brotherhood named after he Holy Prince Boris and Gleb Tolochinsky (the Brotherhood) and paramilitary patriotic Cossack club Kazachi Spas. Oleg Plaksitsky, the Leader of the Brotherhood, is also an Orthodox priest in Belarusian town Drutsk. Members of the Brotherhood like to parade the symbols of the Ukrainian separatists. As Plaksitsky insists, as symbols that denote their anti-fascist principles. On his web site ​Plaksitsky justifies young people participating in military training by saying they need to be ready to fight neo-fascism. He also states that Ukraine has become closely linked to fascism, and refers to the Ukrainians’ participation in punitive operations on the territory of modern day Belarus during World War II as proof. Since 2013, Plaksitsky has organised camps in cooperation with military base number 71325 of the Ministry of Defence of Belarus in the village of Zaslonava near Minsk. This year at the patriotic summer camps near Minsk instructors taught youth mountaineering, how to handle an automatic weapon and how to find your way in and survive in a forest. The priest also taught the youth about the values of the Orthodox Church and its role in Russian culture. The much more developed and influential group Kazachi Spas has been working in Belarus since February 2010. From the beginning Kazachi Spas co-operated with the Belarusian Ministry of Defence, Cossack organisations from all over the former Soviet Union and with the 45th Detached Reconnaissance Regiment located in Russia. Interestingly, the 45th Detached Reconnaissance Regiment took part in the First and the Second Chechen wars, the Georgian-Ossetian conflict and the Georgian-Abkhaz conflict. Cooperation with the Belarusian authorities is a clear indication about the real level of support for pro-Russian paramilitary organisations inside the country. From time to time the Belarusian Ministry of Defence lets Kazachi Spas visit and train at Belarusian military bases. The 45th Detached Reconnaissance Regiment, the Russian Union of Veterans of the intelligence and security services provide instructors and training materials. For its younger participants, Kazachi Spas organises trips to various camps in several countries of the former USSR. Kazachi Spas presents its work to parents as a kind of recreational summer camp. Similar Cossack organisations also thrive in Kyrgyzstan, Kazakhstan, Armenia and Moldova. Military training camps for youth were already functioning in Crimea back in 2004. After the annexation of Crimea, the camp has continued its work but now with Russian instructors. According to the Spas web site nearly 150 youth between 8 and 17 years old participated in its camps in 2014. The youth read about Soviet and Russian history and the role of the Orthodox Church in Belarus. Ideological work in the camps includes making presentations on Belarus and Ukraine as historical parts of the 'Russian World'. 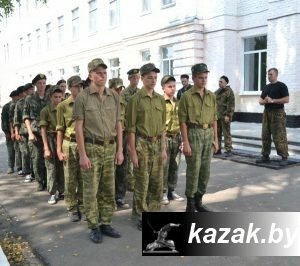 According to the web site of Kazachi Spas “youth should actively train and know how to handle weapons in order to defend Belarus and prevent a Ukrainian scenario in the future”. Without further details about whom the youth should defend Belarus from, such statement are controversial. In the past only a few organisations like the ultra-nationalist paramilitary group Russian National Unity carried out any kind of openly pro-Russian activity in Belarus. Nowadays organisations also lean heavily on religious and ideological indoctrination. Cossack movements have proven their efficacy in Ukraine. Their members were among the first separatists in Crimea, Lugansk and Donetsk. A Real Threat to Belarusian Independence? The 2015 Presidential Elections in Belarus and the Ukrainian Maidan revolution in 2014 launched a new wave activity by pro-Russian organisations. And it seems that the Belarusian authorities are not doing much to prevent these groups from carrying out their work. Perhaps the authorities hope that the paramilitary groups inside the country will prove to be an additional force against the opposition for the Belarusian regime. However, a more important question is whether or not Lukashenka can actually control them. Lukashenka tries to reduce his dependency on Russia to maintain his post. But he cannot openly confront Russia due to Russia's economic and political support. At the moment, both Belarusian civil society and the authorities are in the same boat and should think about how they might be able to prevent Ukraine-style destabilisation efforts by pro-Russian paramilitary groups in Belarus. Strengthening Belarusian national and civic identity as well as carrying out information campaigns about the threat of full dependency on Russia can play an important role in preventing a similarly violent scenario from taking place in Belarus. Raman Kachurka is based in Brest and holds an MA in International Economics from the University of Warsaw.